Researchers from Germany and the United States suggest that the European conquest triggered the loss of more than half the Native American population. The results of their study provide new insight into the demise of the indigenous population. Experts recognise that Native Americans died while at war or due to diseases when Europeans first arrived in the Americas; the question this latest study addresses is how the overall population was impacted by the conquest. Extensive genetic analysis proved that a transient contraction in population sizes by some 50% occurred approximately 500 years ago. 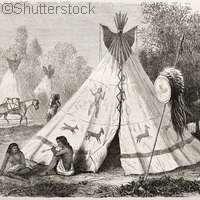 The findings substantiate historical records indicating how the European settlers impacted the peoples of North and South America: diseases, wars, famine and slavery all played a part. The study was presented in the journal Proceedings of the National Academy of Sciences (PNAS). Using the deoxyribonucleic acid (DNA) of Native American women in North and South America, a two-man research team from the Göttingen University in Germany and the University of Washington in the United States drew up a family tree of contemporary and ancient Native peoples. Overall, 137 mitochondrial genomes and 63 old subsequences of this genome were assessed. The researchers pointed out that the mitochondrial genome is passed on through the maternal lineage. Sophisticated bioinformational methods indicated how the Native American population peaked around 5 000 years ago and then remained constant for millennia. About 500 years ago later, the population shrank by half. "These losses were not limited to specific regions, but rather distributed across both American continents, with the severest impacts occurring in the most densely populated regions," said Dr. Lars Fehren-Schmitz of the Göttingen University. This decline did not last very long; the indigenous population started to grow again quite quickly. "This new population growth suggests that the cause of the decline can only be attributable to fast- and short-acting factors, for example, from diseases brought over by the Europeans in combination with war and famine, and was not due to centuries-long processes, as is commonly assumed," he added. Said Brendan O'Fallon of the University of Washington: 'We really saw a big, sudden decrease in population among the Native Americans about 500 years ago. That's, of course, right when the Europeans first arrived. It was sort of a new line of evidence that, really, confirmed, I think, what a lot of people's previous suspicions were but maybe hadn't really been documented in this one area. "The basic idea behind that is that when a population size is fairly small, lots of people tend to share the same ancestors at about the same time. The bigger the population size, the longer it takes everyone to find a common ancestor. So, the tree is just overall bigger." The duo also spatially reconstructed the historical population trends on North and South America by mapping the quick spread along the coastlines and across the continents of the first humans to settle in America. Approximately 15 000 to 17 000 years ago, these peoples migrated from Asia by crossing the Bering Strait, which today lies below sea level. But it was only later, after the individual groups had acclimatised to their new environments, that the population sizes grew substantially, according to the duo.